Esri is supporting the ConnectED Initiative by offering a free ArcGIS Online account to every one of the roughly 115,000 elementary, middle, and high schools in the United States. In 2013, President Barack Obama announced the ConnectED Initiative, an effort to provide K–12 students with digital learning opportunities. He challenged private industry to help transform American education by providing devices, connectivity, support for educators, and learning resources. Esri’s offer of free subscriptions to ArcGIS Online, a cloud-based GIS, is valued at $1 billion. ArcGIS Online is hosted through Amazon Web Services (AWS). Amazon has embraced the effort and committed to at least three years of support for the program. Esri’s participation in ConnectED was announced at the fifth annual White House Science Fair in May. This event celebrates student winners in a broad range of science, technology, engineering, and mathematics (STEM) competitions. 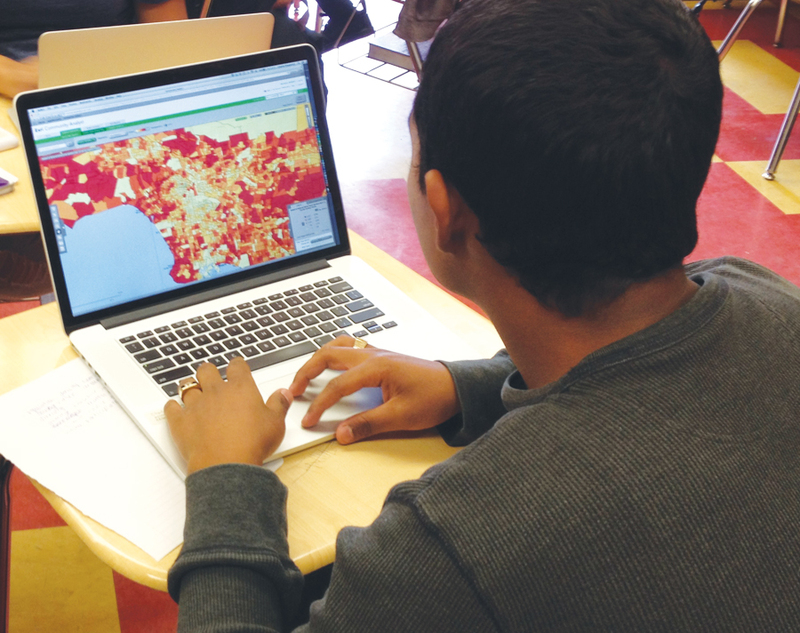 Esri president Jack Dangermond and students who had participated in courses using GIS from Roosevelt High School in Los Angeles, California, and Washington-Lee High School in Arlington, Virginia, joined the White House in making this announcement. Using ArcGIS Online to teach STEM-related courses reinforces the scientific method. Upgraded connectivity that provides high-speed Internet access to every school in America. Access to mobile learning devices to ensure that students and teachers can engage in digital learning anywhere they can connect to the Internet. Support for teachers so every educator has the background necessary to implement digital technology for classroom education. Digital learning resources to make available high-quality digital learning opportunities for both students and teachers. Esri’s ArcGIS Online platform allows anyone with Internet access to use, make, save, and share maps that explore the breadth and depth of the world. Pilot programs in hundreds of schools have demonstrated that educators and students can use ArcGIS Online effectively in all grade levels to enhance learning opportunities and build data analysis, visualization, and problem-solving skills. GIS activities almost always involve thinking scientifically, analyzing mathematically, breaking problems down into manageable steps, and determining a solution using technology. Introducing ArcGIS Online into STEM-related courses reinforces the scientific method and provides students with an effective way to present their findings. Problem solving, critical thinking, data analysis, communication, and collaboration are hallmarks of the work by GIS professionals. These are proficiencies sought by employers everywhere. By introducing ArcGIS Online, educators can help students build these skills, even from a very early age, in preparation for college and career. Map-based classroom activities and service learning projects are an engaging way to foster collaboration between students. For the ConnectED Initiative, Esri has crafted pathways and resources to help educators take advantage of ArcGIS Online organizational accounts. Organizational accounts offer substantially greater capacity and more data, tools, integration with outside applications, analysis functions, and control of sharing than the free ArcGIS Online public account. Educators and students can learn the fundamentals of the software quickly and then launch into new territories by collecting and serving data, analyzing that data in a more detailed manner, and integrating new content with that data. They can practice these skills on computers at school, tablets at home, and smartphones while on the go—anywhere they can connect to the Internet. Esri has been committed to K–12 education for more than 20 years. It has offered special educational licenses to schools, districts, and states and conducted numerous classroom and conference presentations about the benefits of learning and applying geospatial technology. Since 2000, Esri’s education industry team has staged the Esri Education GIS Conference in conjunction with the Esri User Conference. This four-day event attracts hundreds of participants in presentations and exhibits. In June 2014, Esri conducted its sixth annual Teachers Teaching Teachers GIS. More than 300 educators and influencers have committed to share with colleagues their knowledge about using GIS in classroom activities at this educator institute. In 2009, Esri teamed with the National Geographic Society to launch the GeoMentor Program, an initiative to connect GIS professionals with local educators to help them use geospatial technology. With the rising capabilities of ArcGIS Online and improved access to devices for learning, Esri is expanding the call for GIS users to help local educators engage students with GIS. The GIS Certification Institute is supporting this new charge by identifying the mentoring of schools as a way to earn initial or renewal credits toward GIS Professional (GISP) certification. More information regarding Esri’s participation in the ConnectED Initiative is available at connected.esri.com. Other private sector companies that have committed to the initiative include Adobe Systems, Apple Inc., AT&T Inc., Autodesk Inc., Microsoft Corporation, O’Reilly Media, Prezi, Sprint Corporation, and Verizon Communications.